They say you never get a second chance to make a first impression. Curb appeal (or lack thereof!) is the first impression your home makes. There’s no denying the power of curb appeal for a home. Whether you’re planning to sell your home soon or just want it to look good for passerbys, the exterior of your house can make a big difference. 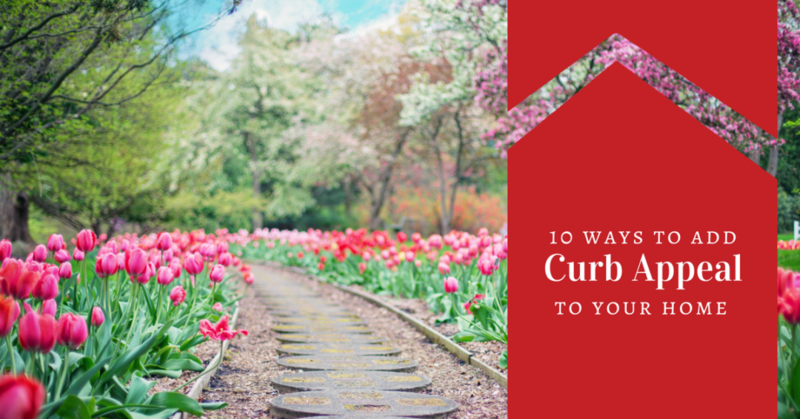 This spring, consider these 10 ways to add curbside appeal to your home to increase its value and offer the best return on investment. The front door is important because it’s a place most guests will see each time they come to your house. 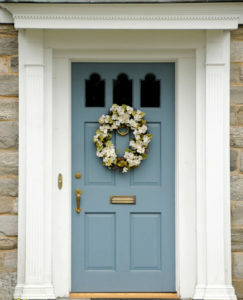 Adding new paint, hardware, a doorbell, or a seasonal door mat can make the entrance more welcoming and inviting. Bright, bold door colors are what gets many homes noticed as people pass by. 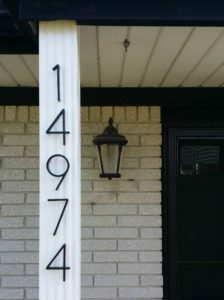 If your house numbers aren’t easy to see or if they’re dirty and dingy, replacing them creates tremendous impact; especially when looking to sell your house. You want to make it as easy as possible for buyers to find your house after they see it listed online. Alternatively, you want your listing to be easy to find online if someone first sees your home while driving by. Keeping the grass freshly cut, the bushes trimmed, and flower beds under control suggests a lot about how the inside of the house is maintained as well. We recommend bushes and small trees that are easy to maintain, mulch or stones that match the color theme of the exterior of your house, and flowers that add a pop of color. It’s also suggested to have some sort of symmetry with your landscaping, whether it’s an even number of bushes on each side of the steps if they’re in the middle of the house, or alternating bush – flower- bush – flower. 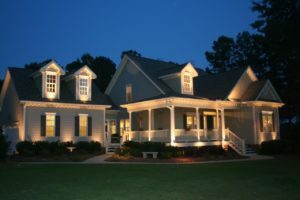 Having a well-lit house helps it stand out at night to buyer. It also makes your home more inviting to guests – and less inviting to burglars! Placing small, in-ground lights along the sidewalk or at the steps can make it easier for guests to walk from their car to the front door. Keeping lights on by the front door or on the porch shows guests that you’re (most likely) home or expecting company. Spotlights on the front or sides of a house can also show off its exterior and attract a buyers’ eyes as they’re driving by at night. The driveway and sidewalk will be the first encounter most guests and buyers have with your home. 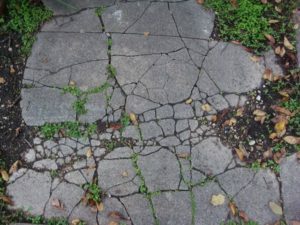 Make sure there are no weeds growing up in the stones, cracks in the driveway, or dirt on the concrete. It’s not very difficult to buy some spray for the weeds and pressure wash the mold and grime off the sidewalk. It does make a difference! 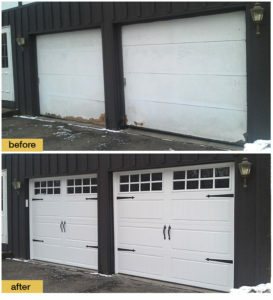 Garage doors can be expensive to replace, but luckily there are easy and inexpensive tricks to make them look brand new again! 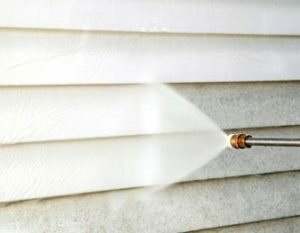 If pressure washing them clean doesn’t work, you can always paint them, add new hardware, or paint black faux-windows on the top. It’s amazing what a difference these simple changes can make! Pick a mailbox that mirrors your home’s trimmings. Dress up mail boxes for curb appeal by painting the wooden post to match the house’s exterior color, or by surrounding it with a beautiful flowering garden. There are very unique mailboxes that can grab attention, but if you want to sell your home, it’s best to go with one that is more standard and that matches others in the neighborhood. Most importantly, make sure your mailbox is standing straight and not damaged! Siding gets dirty and damaged over the years, no doubt. But sometimes a good scrub or light pressure wash can make a world of difference! When it doesn’t, paint touch-ups can help. Be sure to do the same with your trim and window shutters. Don’t be afraid to think outside of the box when it comes to window shutters too! A bright, cheerful color can make your home really stand out and feel welcoming. It’s amazing how many leaves, branches and other debris can get stuck up in the rain gutters. 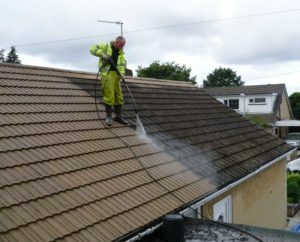 Make sure yours are clean and clear to support rain flow and to look tidy. 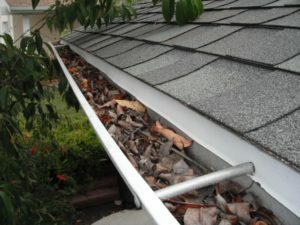 If you have damaged gutters or downspouts, they’re a cheap replacement that can make your house look sharp. This important not just for great curb appeal, but it an also help your home pass an inspection! 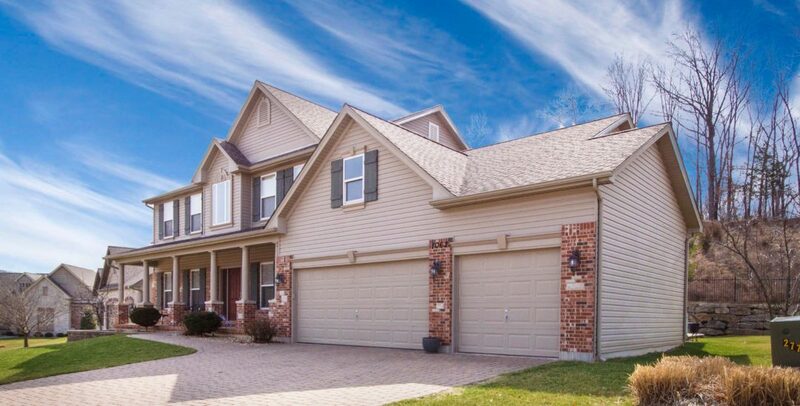 Last but certainly not least, the roof… It’s very common for shingles to fall off or roofs to get dirty with streaks. A good cleaning and shingle patching can give your home a fresh look. If your roof needs to be replaced, it’s important to face that reality. If necessary, it’s best to replace the roof before listing your house for sale. That way, your roof and home will look great, and you’ll avoid a major red flag in an inspection. If you can’t replace the roof, be prepared to reflect that in your price or to come down during negotiations. 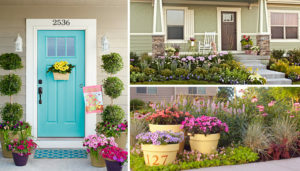 There’s no better time than spring to make these quick fixes to your house to add curb appeal! If you’ve implemented these updates and are ready to list your house, or if you’re looking to purchase a home that has stunning curbside appeal, contact us today! It’s always a good idea to talk things through with a professional, and we’d love to help! The holidays may be the most wonderful time of the year, but ‘tis not the season for peak real estate sales. It’s such a busy season that it’s no surprise activity drops off over Christmas and New Year’s. However, there are some buyers who take advantage of the downtime from work to go house hunting, so it’s important to be prepared. While there may be fewer buyers, the ones who are out there are usually pretty motivated! So what do you do if your home is still on the market over the holidays? Don’t worry! You can still decorate for the holidays and enjoy family traditions, all while having your home show-ready for buyers. If you are willing to go the extra mile, you can use the season to your advantage and make your home a true standout on the market. The key is to decorate in a way that emphasizes your home’s best features. 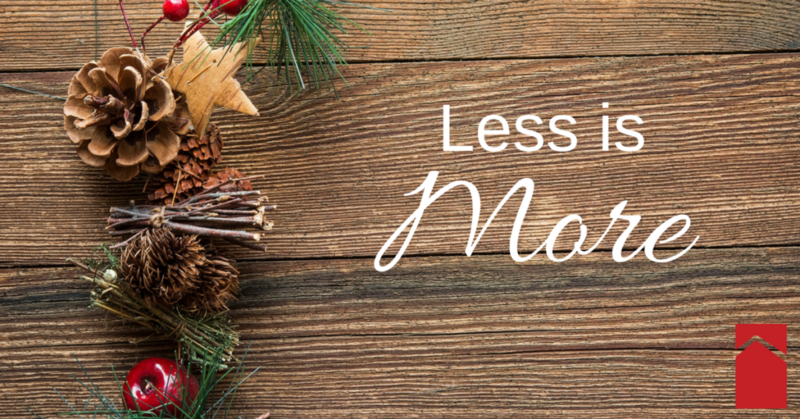 This may mean scaling back or changing your usual holiday décor. 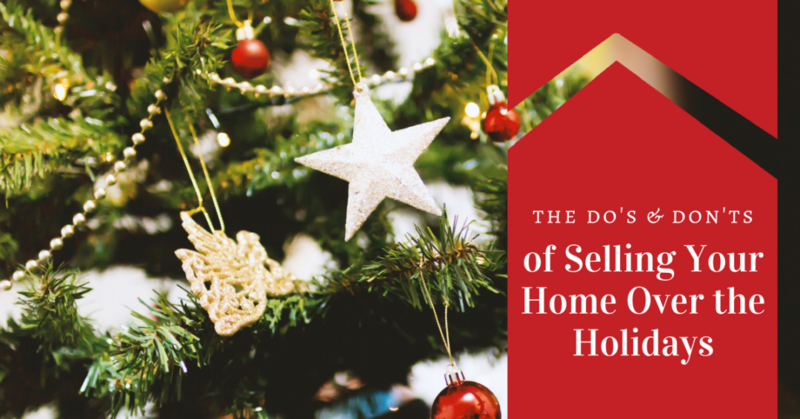 Read on for the do’s and don’ts of selling your home over the holidays! Before you pull out your bins full of holiday cheer, remember to declutter and clean your living space. You don’t want to overcrowd buyers’ senses as they walk from room to room. For every holiday decoration you add, remove another item to storage. Less is more! Too many decorations can distract buyers and take away from your home’s best features. Think strategically about every decoration you place in your home. Don’t block a beautiful view by putting stick-on snowflake decals on your windows. Do draw attention to an elegant fireplace with tasteful garland, but don’t overdo it with too many knickknacks or personalized stockings. Emphasize your home’s architecture by hanging mistletoe in an arched doorway or wrapping garland around the staircase. 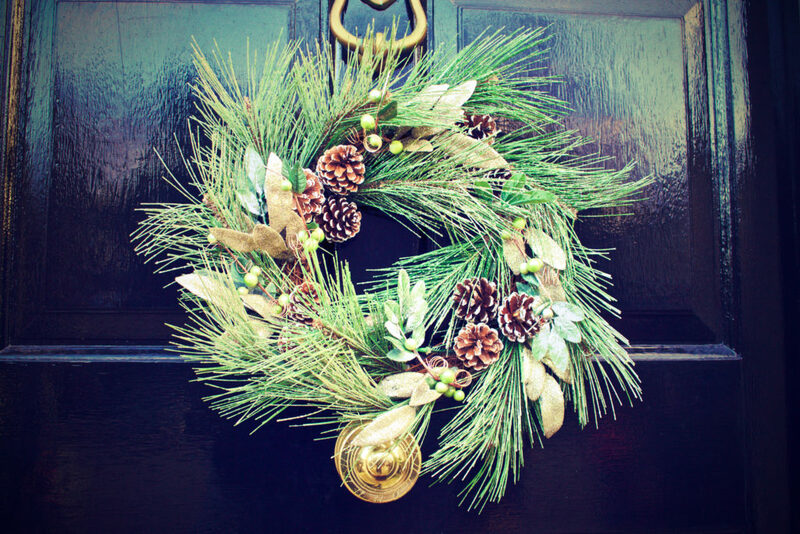 Place a bowl of pinecones on a table, and hang an evergreen wreath on the front door. These are examples of neutral decorations that accentuate everyday features of the house. The less-is-more mantra of home staging may tempt you to forgo holiday cheer altogether this year. But a few subtle, tasteful touches can create a warm and festive feeling that really appeals to buyers! 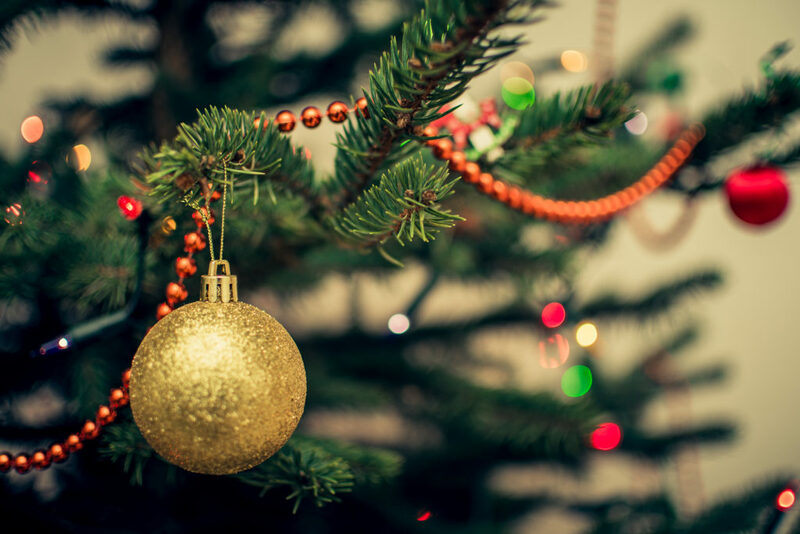 DO Put Up a Christmas Tree – but proceed with caution! Even when buyers are house hunting in July, they often try to envision where a Christmas tree can be placed in the home. So this is a great opportunity to show them! But before you put up a tree, there are some important things to consider. First and foremost, you want to keep proper proportions among the furniture and accessories in your house. If the Christmas tree overpowers the room and forces the furniture to be squeezed together, the look is unappealing and the room will feel smaller. Go ahead and remove extra furniture if necessary. You can also consider getting a skinnier tree than usual to avoid overcrowding the room. If you have tall ceilings, show them off with a tall Christmas tree. If you’re fortunate enough to have multiple large rooms, you may consider adding additional trees throughout the house. As long as the proportions are right, having multiple trees can draw attention to how large and spacious your home is. Regardless of the size of your tree, tasteful ornaments and trimmings are essential. If you have funny or over-the-top family ornaments, it’s a good idea to leave them boxed away this year. Instead, go with a cohesive color scheme for your ornaments, accented with white lights. This is certainly a less personal approach, but that’s a good thing… You want to present a neutral backdrop that lets buyers imagine their own tree and decorations in the home. When it comes to decorating the exterior of your home, steer clear of inflatable snowmen on the lawn or a Santa on the chimney. One person’s “merry” is another person’s “too much!” Make sure to stick with classic light displays while your home is on the market. Use simple, white string lighting to play up your home’s architecture and landscape. If a Realtor wants to show the house in the evening, outdoor lights can be appealing and bring a feeling of holiday cheer. The smell of simmering cider or baked cookies will delight the senses. Even if you decide not to decorate, introducing seasonal scents can make buyers feel right at home. 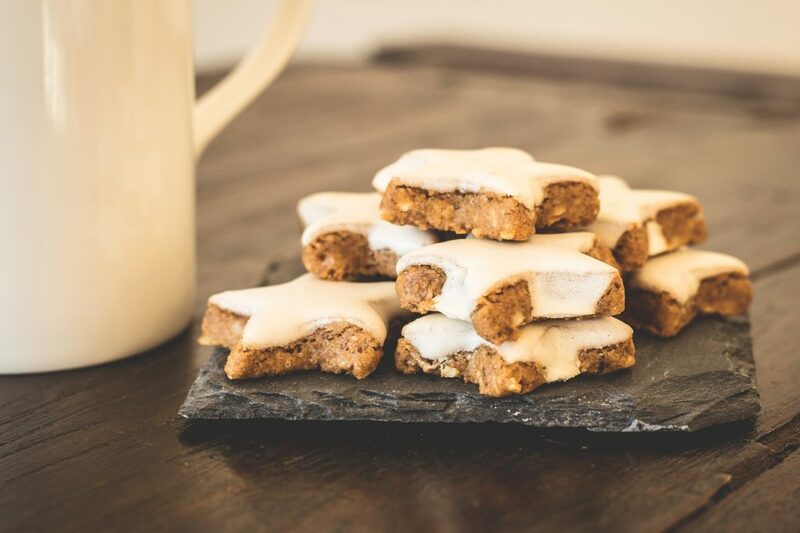 When you know a real estate agent is bringing clients to look at the house, leave a plate of holiday treats on the counter. A roaring fireplace is also a cozy way to celebrate the winter, warm visitors, and show off one of your home’s best assets. When it comes to candles and other home-scent products, opt for scents that are very subtle. Scents of pine and balsam are pleasant during the holidays, as long as they aren’t overpowering. Be wary of other popular seasonal scents; you never know who will have an aversion to heavy cinnamon or vanilla! In the end, the most important holiday decision you’ll make is whether to keep your home on the market during the holidays. You may have fewer house hunters, but more motivated buyers. And remember, very few home buyers are turned off by holiday decorations – unless they’re truly over-the-top! Your holiday decorations may not match buyers’ tastes, but it’s kind of like paint colors… They can certainly help if they look good, but they’re rarely deal breakers. So go ahead and embrace the season! 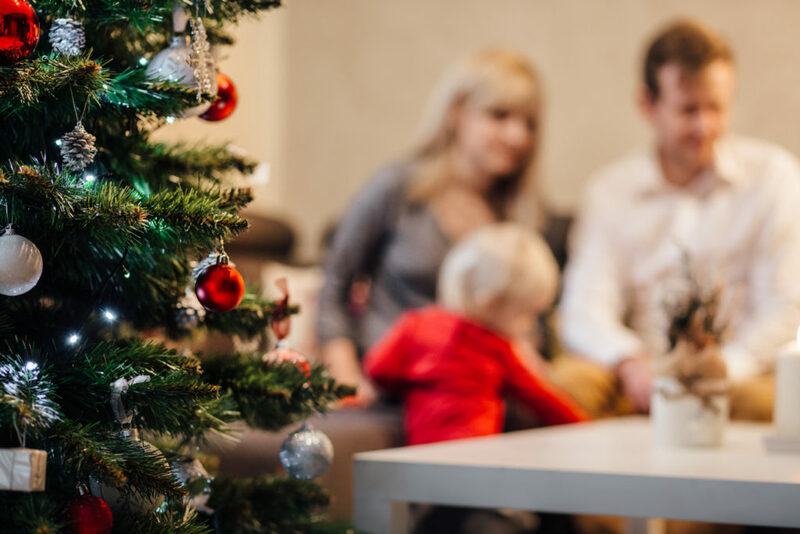 When buyers see your home full of holiday cheer, they’ll envision their own family sharing special holiday moments in the house. A festive home is a great selling point that can certainly be used to your advantage! Don’t want to wait to get your home on the market? We’d love to help! Contact us and one of our expert Realtors will be in touch! It’s no surprise that the housing market spikes during the spring and summer months. Kids are out of school, things slow down at work, and people are anxious to get into a new house before schedules become hectic again. But it is definitely possible to sell your home in the fall and winter, especially on the Eastern Shore. There may be fewer buyers, but there are also fewer listings. This means you have a lot less competition, so it’s easier for your home to stand out as a great choice. Fall and winter bring colorful foliage, warm scents, and an abundance of decorating ideas. You can leverage these advantages to make your home feel bright and welcoming. 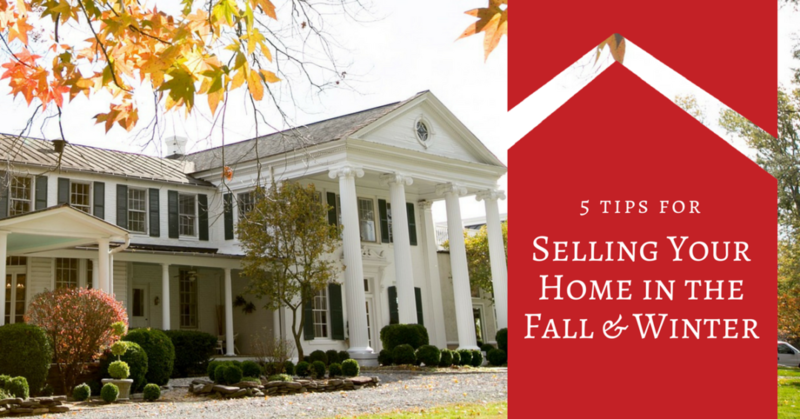 Read on for our tips and advice on how to sell your home in the fall or winter! When buyers are house hunting during the fall or winter, they pay a lot more attention to your HVAC system and overall home insulation. Have your heat pump, furnace, or boiler serviced prior to putting your house on the market. Change your air filters and check all weather stripping on doors and windows. If you have a fireplace, show it off! Have it on when buyers arrive so they can appreciate the advantage of having an additional heating source. It’s a good idea to have a file buyers can look through with maintenance records and receipts for products you’ve purchased to winterize your home. This will highlight that your home is ready for the upcoming months, and it gives buyers confidence that they’ll stay warm through the winter and cool through the summer. This rule applies no matter the season! It is so important to make a positive first impression with a clean, tidy house. And it’s especially important in the winter. In colder months, potential buyers will pay more attention to your interior space. They’ll probably take only a quick look around your yard, but they’ll spend lots of time inside. That means buyers will notice every little detail. Clean your house, and clean it well! Scrub both outside and inside cabinets, dust ceiling fans and scrub the tiled shower. Declutter all spaces, organize the closet and the garage – nothing should go unnoticed. This is your chance to show of your space! Don’t forget to maintain your exterior space as well. Leaf and snow-covered sidewalks can make a perfectly nice home look sloppy and poorly maintained. Rake up those dead leaves or shovel the sidewalk and deck after it snows. This demonstrates that even in inclement weather, their future lawn can be easily managed and maintained. The fall and winter months are associated with the scent of pumpkin spice, peppermint hot chocolate, cookies, and yummy homemade pie. These are the scents of comfort and home, so use them to your advantage! You can also use holiday decorations to play up the warm, welcoming feel of your home. If hosting an open house, bake fresh muffins and have holiday music playing softly in the background to set a warm and welcoming mood. Try displaying vases of fall foliage, or add a bowl of seasonal fruit to the kitchen table. Don’t overdo it though; you want to enhance your home’s appeal, but not obscure it. A tasteful display will show off your home in its best light. A cozy atmosphere will give potential homebuyers a warm feeling. One note of caution, though… When you take photos for your online listing, it’s best to stay neutral with your décor. Avoid seasonal or holiday décor in your listing photos. That way, if your house is on the market for a few months, your photos won’t look out-of-date. In the dead of winter, you won’t be able to show off your wonderful garden or flower beds. So it’s a good idea to display photos of your house that were taken in spring and summer. Show off your yard when the grass was green and the peonies were blooming by the pool. Highlight garden beds and decorative patio furniture. This will allow future buyers to envision themselves enjoying the home year-round. During the fall and winter months, it’s particularly important to avoid setting your listing price too high. You have an advantage listing during these cooler months due to less competition. However, overpricing your home will still scare away potential buyers. It’s always a good idea to ask a local real estate professional for comps in order to pick a reasonable price range. Comps will allow you to compare similar homes in your neighborhood, including the prices of homes that are currently on the market and those that recently sold. You don’t want to get your heart set on a certain price if most buyers in your area are negotiating and buying homes at prices significantly lower than yours. With these details, your agent can help you select an appropriate asking priced based on the current market trends. Using these tips and tricks will help your home stand out, and you’ll find a homebuyer and seal the deal before spring arrives! Are you ready to list your home this fall? Contact us and we’ll match you with the right Realtor to get your home listed and sold! Do you need to sell your home FAST? You need to approach things a little differently if your goal is to sell your home as quickly as possible. Read on for our top five tips for selling your home fast! 1: First impressions are everything! Buyers draw a lot of conclusions based on what they see within the first minute of visiting your home. A house that looks neat and tidy suggests that the home has been well maintained. A messy house makes buyers wonder if you’ve been messy with maintenance and repairs. Make sure your yard is tidy and has good curb appeal. This is one area where you may want to consider doing some upgrades before listing your home. Usually, investments in curb appeal have a significant positive impact on the value of your home. It’s still a good idea to discuss this with your Realtor first, though. Your Realtor can advise whether or not the investment is likely to pay off. If nothing else, just make sure the exterior is well mowed, weeded, and clutter-free. If algae has formed on the side of your house – something very common in our humid climate – have your home professionally power washed. On the inside, make sure your home is spotless and free of clutter. Clean, clean, clean, and then do some more cleaning! Do whatever it takes to scale down your stuff so that buyers have nice, clear views throughout the home. This includes removing personal photos. The old adage is true… You want buyers to picture themselves living in your house. That’s hard to do when your photos and stuff are all over the place. Consider fresh paint if your walls are scuffed or dirty. Even if you’ve cleaned the house from top to bottom, dingy walls can create the impression that the home is dirty. 2: Price your home competitively. This is probably the #1 factor that will determine whether or not your house sells quickly. If you over-price, you’ll have little interest from buyers. And the longer your home sits on the market, the less appealing it is. It’s hard to overcome the initial impression that the owner (you) isn’t willing to sell at market value. It’s your realtor’s job to understand the market and provide guidance on pricing – carefully consider their advice! This article about how to price your home also has some helpful advice. If you aren’t seeing much activity once you’ve listed your house, it’s probably because your price is a bit high. Discuss lowering the price with your Realtor. It’s better to do that sooner rather than later if your goal is to sell your home quickly. 3: Tackle any necessary repairs. Most offers will be contingent upon a home inspection. Also, you’re legally required to let buyers know about any problems you’re aware of. So if there’s something that needs to be fixed, go ahead and take care of it. This will result in a better inspection and a faster close. A word of caution though: Be realistic about your ability to tackle any repairs yourself! If you’re not experienced with repairs and maintenance, you’ll be better off hiring a professional. A sloppy repair is often worse than none at all. Also, don’t pursue any major renovations without discussing with your Realtor first. 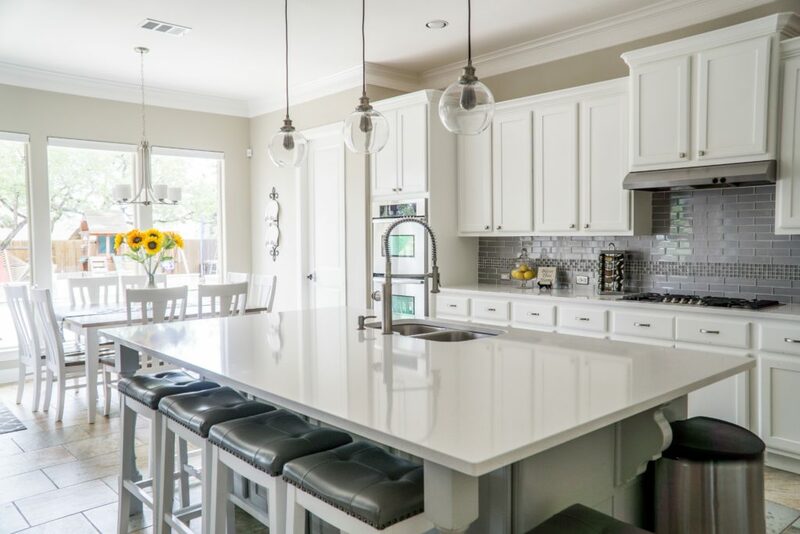 It’s unlikely that a remodeled kitchen or bathroom will increase the value of your home enough to make it worth the cost. You’re better off reducing your price a bit to account for these outdated spaces. That gives the buyer the opportunity to make their own changes that suit their tastes and lifestyle. 4: Get great photos of your house. Listings with great photos get significantly more traffic. Great photos practically pull buyers through your front door! Take exterior photos on a bright, sunny day. Make sure interior photos are well lighted and in sharp focus. Open the curtains to let the natural light in. Make sure your rooms are clutter-free and looking their best. If you’re not a great photographer, ask a friend with a good eye to help you out. You may even want to consider professional photography. If that’s not an option, this article about taking real estate photos with an iPhone offers great advice. 5: Harness the power of social media! It’s your Realtor’s responsibility to market your property, but social media makes it easy for you to help out. Ask your realtor to post your listing on their Facebook page and other social media platforms. Like and share the post, and ask your friends and family to do the same. This exponentially increases the number of people who will sell your listing. 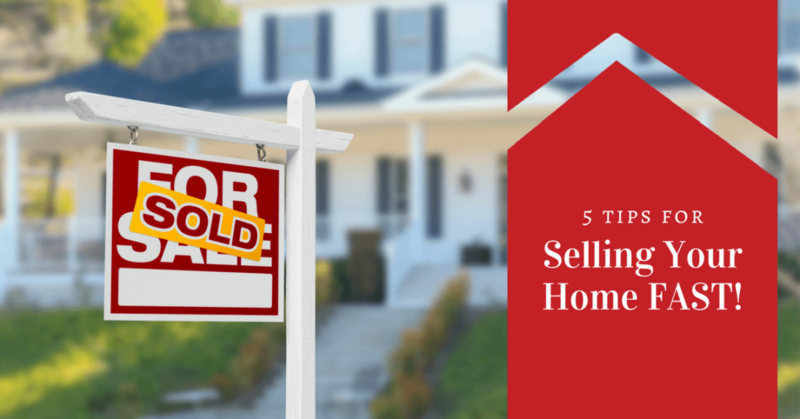 We’d be happy to share more tips on how to sell your home fast! Just give us a call or shoot us a message if you’d like to discuss a marketing plan for you home. There is one thing that matters more than anything else when selling your home: Pricing it right! The most important thing your Realtor can do is guide you through how to price your home. Overpricing your home can have a snowball effect on the entire sales process. If you’re priced too high, you won’t get any interest in your home. Your house will sit on the market, and this looks bad to buyers. Even when you’ve dropped your price, buyers will wonder why your house has sat unsold for so long. They’ll wonder if something is wrong with your home. They’ll assume lots of people have looked at it, and no one wanted it. That’s a scenario you definitely want to avoid! If you follow the process described below, you’ll be on the right track. 1. Meet with your Realtor to discuss your goals for the sale. Do you need to sell as quickly as possible? Are you willing to make some improvements if that will help you get a higher price? Are there any major repairs needed that will impact the value of your home? 2. Review comps with your Realtor. After your initial meeting, your Realtor will research recent sales of comparable homes (“comps”). This is an indication of the market value of your home – more on that coming up. 3. Agree on a pricing strategy. You and your Realtor will agree on a list price based on your goals, the condition of your home, and the comps. Your strategy should also include a plan to reduce the price if you haven’t received much interest after a certain period of time. Remember, you don’t want your house sitting on the market for a long time. So if you’re not getting interest, drop your price sooner rather than later. What is your house worth? Whatever someone is willing to pay for it. That’s its market value. It can be tough to face, but buyers are never going to pay more than the current market value of your home. It doesn’t matter what you paid for your home. It doesn’t matter what its tax assessment is. It doesn’t even matter how much you love your home and how wonderful your memories are. The only thing that matters is the market value at the time you list your house for sale. That’s why reviewing and understanding comps is so important. These recent sales are the best indicator of what your home is worth. It’s okay to look at current listings too. That can help you understand your competition. But keep in mind that a house listed for sale is very different than a house that has actually sold. Your neighbor down the street may have their home priced higher than yours. But if you’re both overpriced, that doesn’t really matter. An important point to note is that it’s more difficult to gauge market value in rural areas. In cities, there are tons of properties being bought and sold all the time. This keeps market value fairly steady. In rural areas, there are far fewer transactions. There’s also a lot more diversity in the types of homes that are bought and sold. This means market value can go up and down a lot in a relatively short period of time. So be prepared to drop your price fairly soon after listing if you aren’t getting much interest. This is a common mistake a lot of sellers make. The problem with this approach is that it will cause a lot of buyers to skip over your house right from the beginning. They’ll never even consider it because it’s overpriced. Instead, price your home for what you really think it’s worth. If your home is priced fairly, a genuine buyer will make an offer at or very near your list price. You may need to negotiate a little, but you shouldn’t be too far apart. When it’s time to sell your home, try to think of the process as a business transaction. We’ll be honest, that can be really hard to do. You probably love your home and have lots of happy memories there. But try to remember that your love for your home can cloud your judgement about its market value. Try to be aware of that from the beginning, and don’t take it personally if your Realtor suggests a lower price than you had in mind. Your Realtor’s goal is to help you sell your home under the best terms possible. So take a deep breath, try to step back emotionally, and trust their professional advice. 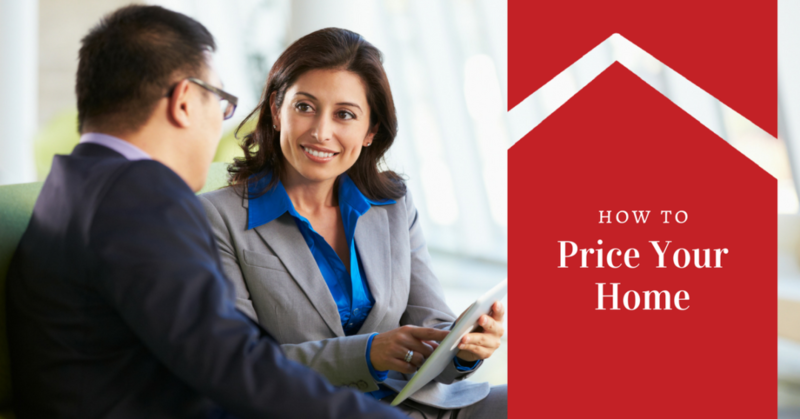 Once you have a pricing strategy, it’s time to get the house listed! Check out our post about how to host an awesome open house. If you’re in a hurry to sell, this post about how to sell your home fast is just what you need. Ready to get your home listed? Contact us to get started!